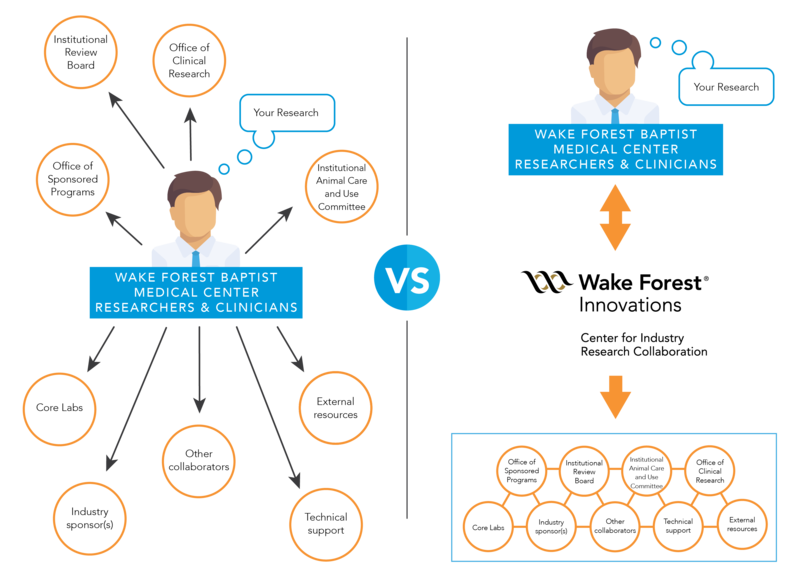 As a principal investigator or member of a study team at Wake Forest Baptist Medical Center, you know that there are a million moving parts to any research study. Both preclinical and clinical studies require a lot of time and resources. Even if you want to build your research portfolio, you are often so busy with studies at hand or with patient care that finding new research opportunities can be put on the back burner. 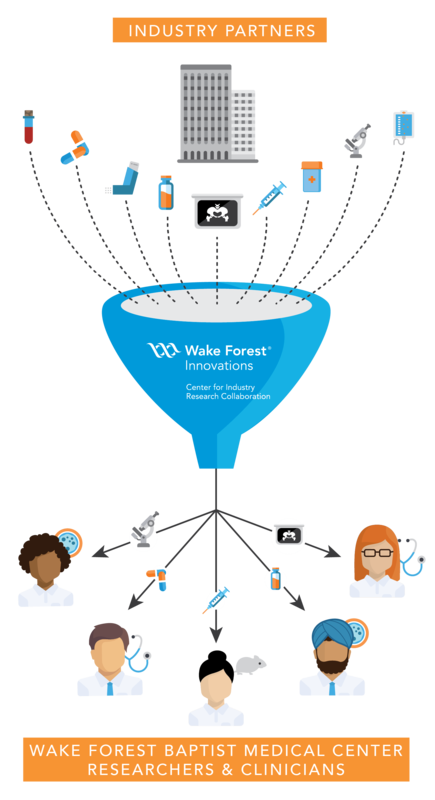 Here are two ways that the Center for Industry Research Collaboration of Wake Forest Innovations can help manage some of those complexities and grow your clinical and preclinical research capabilities through industry-sponsored projects. 1. Wake Forest Innovations can help you make the right matches with industry sponsors. When you are already working on grant-funded projects or treating patients, you may not have the time to look for industry-sponsored work. However, industry-funded projects can supplement gaps in grant funding, put you on the front lines of medical advancements and build your credibility as a research team. The Center for Industry Research Collaboration can do the legwork to connect you with industry partners in two different ways. First, Wake Forest Innovations can bring industry studies to you (see Figure 1). We manage, sort and distribute a large set of study requests brought to us by industry partners searching for the right investigators and collaborators. These potential projects can range from early discovery to full-blown clinical trials and any intermediate step along the way. When we know what you might be interested in, we can funnel industry-sponsored study requests to you for consideration. Our experts can also take your research interests and expertise and promote them to potential industry partners. If you’re an investigator looking for a company to partner with, we can help bridge the gap between your research and companies working in similar areas (see Figure 2). And if you are part of a study team that’s too busy to look for the next study because you’re already conducting another, we can take that piece off your plate. Does conducting research with industry pique your interest? All you need to do is let us know what your interests are so that we can do the heavy lifting in landing your next research project. 2. Wake Forest Innovations can help you wrangle all the pieces of the study puzzle. Whether you are an investigator or a member of a study team, you know all the hard work that goes into a preclinical or clinical study. There are site visits, confidentiality agreements, budget development, protocols, regulatory approvals and contract formation—and those all happen before the science even starts. Then begins study coordination, invoicing, data management, reporting and archiving, among other activities. Accomplishing all of these tasks requires a lot of coordination and communication between many groups that span the Medical Center, not to mention keeping the study sponsor in the loop. Investigators and study teams have to communicate with the industry sponsor, the Office of Sponsored Programs, the Institutional Review Board, the Office of Clinical Research, the Institutional Animal Care and Use Committee, core laboratories and more (see Figure 3). We can handle much of this process for you. By working with us, you decrease the groups and tasks that you have to coordinate. We help navigate the differences between industry and academia to make sure that each party gets what they need from the study. We facilitate, and you investigate. In other words, you do the science; Wake Forest Innovations will handle the paperwork. Would you rather be analyzing data than filling out administrative forms? We exist to make your life easier; all you need to do is let us know that you are interested. Learn more about the Center for Industry Research Collaboration.